Dru Pagliassotti writes steampunk (Clockwork Heart) and horror (An Agreement with Hell) and owns The Harrow Press, which publishes horror fiction anthologies. Her stories can be found on Amazon as standalones and in anthologies. Dru is also a professor at California Lutheran University, where she teaches media studies. Here is Dru Pagliassotti’s website. Click here for more stories by Dru Pagliassotti. Kat chats with Dru Pagliassotti, author of Clockwork Heart, her first novel. Clockwork Heart is your first published novel, but how long have you been writing? Clockwork Heart — (2008-2014) Publisher: A steampunkish romantic fantasy set in Ondinium, a city that beats to the ticking of a clockwork heart. Taya, a metal-winged courier, can travel freely across the city’s sectors and mingle indiscriminately among its castes. A daring mid-air rescue leads to involvement with two scions of an upperclass family and entanglement in a web of terrorism, loyalty, murder, and secrets. I really don’t know what sort of story this is. It’s an adventure, it’s a mystery, it’s a crime novel, and a romance kind of all throw into one. It's a complex blend of genres all set in a different world where technology is far behind our modern times in many respects, but has been carefully enough thought out that it makes sense. 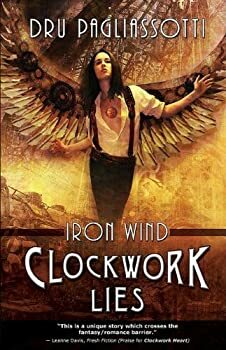 It’s been six years, but Taya, Cristof and Alister are back in Clockwork Lies: Iron Wind, a sequel to Dru Pagliassotti’s Clockwork Heart. 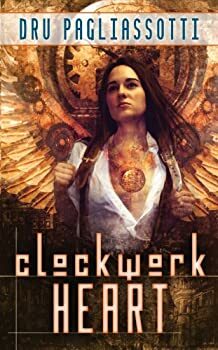 You’ll really need to read that previous book to get the most out of Clockwork Lies: Iron Wind and this review will have spoilers for that first book, so proceed with caution. Alister was blinded and exiled after his treasonous deeds in Clockwork Heart. His brother Cristof, who was happy just being a clockmaker, has reluctantly taken Alister’s place as an Exalted. He married Taya, the courageous Icarus who carries messages up and down the mountain city of Ondinium. An Agreement With Hell — (2011) Publisher: In the divine struggle between good and evil, humans are hardly noticeable to the mal’akhim, but when an ancient seal is broken on the grounds of a California college campus, beings from dimensions beyond the balance of holy and unholy erupt from the earth. A retired priest and an ailing magickian must trust the mysterious Walker Between the Worlds and his skin-eating demon familiar as they step through Heisenbergian passages of probability and battle forces that are so far beyond demon they cannot be fully seen in earthly dimensions. Amidst the earthquakes and interdimensional intruders, the students and staff of California Hills University step across the boundaries of their knowledge and faith, revealing their true natures as the night erupts in earth and blood.